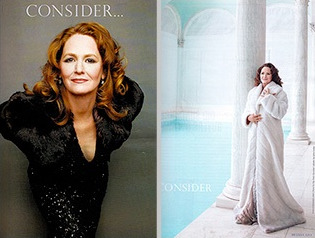 The Hollywood press is tsk-tsking at the perplexing campaign actress Melissa Leo has launched to support… Melissa Leo. The “Fighter” star already wrapped up the Golden Globes and SAG award for best supporting actress (for her portrayal of a squawking, chain-smoking mum). But instead of relying on that momentum — and the campaigns put out by the film’s distributor, Relativity — Leo took out some “for your consideration” ads of her own. Leo explained to Deadline Hollywood that she shelled out for the ads because she thinks she’s been cheated out of the “free press” that comes from being featured in women’s magazines. But there’s no way these cheesy, low-budget shots will bring her any closer — unless she’s aiming for the cover of Faux Fur Digest. Leo clearly underestimated the value of the unassuming underdog image she had going for her (as evidenced by this New York Magazine Q+A, in which she claims to be a total Hollywood outsider). Nothing like wearing a floor-length coat in a Parthenon-style pool house to shatter your down-to-earth rep.